After preparations which lasted for about two months, mass riots began to take place every Friday near the border between the Gaza Strip and Israel. The declared purpose of these demonstrations and riots, organized and orchestrated by Hamas, was to break through the border fence and have masses of people enter into Israeli territory. According to the Palestinians, this should symbolically realize what the Palestinians refer to as the “right of return” of the Palestinian refugees (i.e., the destruction of the State of Israel). Another objective was to bring the severe economic situation of the Gaza Strip into public awareness and exert pressure to “break the siege.” The demonstrations and riots still haven’t ended. Hamas intends to pursue them also during the forthcoming weeks, even at the cost of more fatalities. Hamas aspired to mobilize hundreds of thousands of Gaza Strip residents to participate in these events. However, eventually, the number of participants did not exceed several tens of thousands. In the two peak events, on March 30, 2018 (Land Day, the opening events) and on May 14, 2018 (the day on which the US Embassy was relocated to Jerusalem), about 40,000 residents took part in the demonstrations and riots. On other Fridays, Hamas could not mobilize that many residents. During the rest of the week days, several thousands of people took part in the riots and there were also a number of attempts to carry out terrorist attacks. The riots culminated in the events of May 14, 2018, with attempts, halted by IDF soldiers, to penetrate en masse into Israeli territory. The attempts to break into Israeli territory were accompanied by intentionally increased violence, throwing pipe bombs and Molotov cocktails at IDF soldiers; attempting to cut the fence; and sending Molotov kites, which set fire to fields in Israeli communities adjacent to the Gaza Strip. As a result of the increase in the number of rioters and the extensive violence on their part (which was unusual compared to previous incidents), the number of fatalities reached its height. Those fatalities consist of Palestinians who were in the front line of the rioters, most of them Hamas operatives. Emphasizing the message to Palestinians that “sacrificing” oneself for “Palestine” and dying as a “Martyr” while carrying out a terror attack against Israelis is an admirable act, the Bethlehem branch of Abbas’ Fatah Movement lauded the female suicide bomber Andalib Takatka, who murdered 6 when she carried out a suicide bombing in 2002. We all bow in admiration and appreciation before the soul of heroic Martyrdom (Shahada) seeker Andalib Takatka." On Tuesday, Hamas fired an enormous wave of mortars into Israel, striking an Israeli kindergarten but causing no injuries. Hundreds of thousands of Israelis were forced to bunkers to weather the attack. That wave of mortars followed an attempt over the weekend by Islamic Jihad terrorists to cut through the Gaza border in order to murder Israelis in their beds; during the chase, terrorists fired at Israeli troops. One terrorist was killed, and another injured. The Israeli Defense Forces also announced that several days ago, Hamas attempted to fly a drone loaded with explosives over the border. The IDF will respond with great force to these attacks. Israel will exact a heavy price from anyone who tries to attack it, and we view Hamas as responsible for preventing such attacks against us. The media coverage of Hamas’ and Islamic Jihad’s latest acts of terrorism has been skimpy at best, even though just two weeks ago, the media went full-coverage over terrorist-organized riots on the Gaza border during the US’ Jerusalem embassy move. During those riots, Hamas announced that the vast majority of Palestinians killed had been Hamas and Islamic Jihad terrorists, and stated openly that they were attempting to use protests at the border as a cover for paramilitary action. Nonetheless, the American and European media insisted that Israel was firing indiscriminately at peaceful protesters, and that the Jerusalem embassy move had been the cause of the violence. At least 28 mortar shells were fired at southern Israel in at least three separate barrages Tuesday morning as sirens blared throughout the area, the army said, amid heightened tensions along the Gaza border. One person was lightly injured by shrapnel in his shoulder and was being treated at the Soroka medical center in Beersheba. There were no reports of significant material damage. One shell hit a tree in the yard of a kindergarten shortly before children were due to arrive. The shellings appeared to be the largest attack from the Gaza Strip since the 2014 war, known in Israel as Operation Protective Edge. The head of the Eshkol region told Channel 10 news that the army told him the attack was carried out by the Palestinian Islamic Jihad terror group, as revenge for the Israel Defense Forces killing three of its members in a cross-border exchange earlier in the week. There were no immediate reports of a significant Israeli military retaliation to the attacks. Massive reprisal raids were expected, following the repeated, highly irregular mortar shellings on Tuesday morning. Following the Gaza mortar attacks, Defense Minister Avigdor Liberman called for a “special situational assessment” from IDF Chief of Staff Gadi Eisenkot and other senior figures from Israel’s security services. They were due to meet in the army’s Tel Aviv headquarters, known as the Kirya, Liberman’s office said. Palestinian media reported that Hamas and other terrorist groups were abandoning their positions in the Gaza Strip ahead of an expected forceful response by the IDF. The initial, primary bombardment came at 7 a.m., when approximately 25 mortar shells were toward the Sha’ar Hanegev and Eshkol regions, as parents were beginning to send their children to school, the IDF said. The army said its Iron Dome missile defense system intercepted the majority of the incoming shells from the first barrage. Projectiles were fired from Gaza into southern Israel Tuesday afternoon in a fresh salvo of cross-border fire amid the most intense fighting seen in the region in years. There were no immediate reports of injuries from the afternoon barrage. Sirens blared in Israeli communities in the border region at least six times starting around 3 p.m., sending residents fleeing for shelter hours after having been given the all-clear following a morning volley. 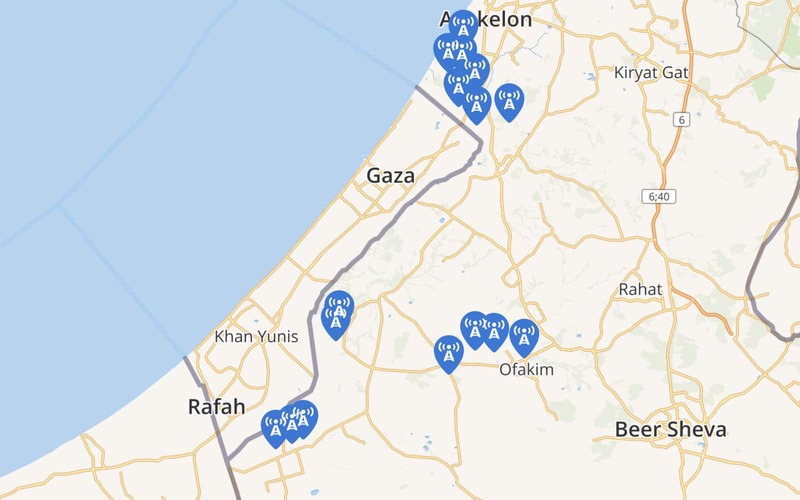 Sirens were reported as far away as the Ashkelon industrial zone and Ofakim, dozens of kilometers from the Strip, indicating the projectiles being fired were longer range than the mortar rounds shot earlier in the day. There was no immediate word on how many rockets or mortar rounds were fired. The military said a total of 25 rockets had been knocked down by Iron Dome missile defense batteries as of 4 p.m., though the tally was not official. At least two projectiles in the afternoon barrage landed near Kibbutz Re’im, according to emergency response officials. There were no reports of injuries. One man was lightly injured by shrapnel in the morning. Palestinians in the Gaza Strip opened fire with a machine gun at the southern Israeli town of Sderot on Monday night, causing damage but no injuries, in the second such attack in as many weeks, the army said. The heavy gunfire triggered incoming rocket sirens in Sderot and the surrounding Sha’ar Hanegev region, which sent thousands of Israelis rushing to bomb shelters, the army said. The shooting attack came hours after a clash between Israeli soldiers and Palestinian gunmen on the Gaza border earlier in the day. The gunfire damaged a number of buildings in Sderot, the city said, as well as at least one car, according to Israel’s Hadashot news. This was the second machine gun attack on Sderot in under two weeks. On May 16, bullets also struck a number of homes in the town, though in that case no rocket siren was triggered. Israel struck tens of targets belonging to Islamic Jihad and Hamas across the entire Gaza Strip after several mortar and rocket barrages were fired towards Israeli communities on Tuesday major escalation in the southern part of the country. “The situation in which a terror organization fires into Israeli communities is unacceptable. Since noon we have been operating throughout the Gaza Strip in a series of attacks which has not been done since Operation Protective Edge" in 2014, said IDF Spokesman Brig-Gen. Ronen Manelis in a phone call with reporters, explaining that over 35 targets were struck including seven military compounds, weapons storage sites, naval targets and terror headquarters. Among the targets was a Hamas tunnel which stretched from Rafiah one kilometer into Egypt’s Sinai Peninsula and then 900 meters into Israel near the Kerem Shalom crossing. According to Manelis the tunnel, which was the 10th tunnel destroyed by Israel since October, was not yet ready for use but was meant to act as both as an offensive attack tunnel as well as a weapons smuggling tunnel. The Some 30 mortars and some Iranian rockets were launched by Islamic Jihad towards Israeli communities with at least 25 intercepted by the Iron Dome missile defense system, the IDF Spokesman said. A White House official has weighed in on a series of rocket volleys from Gaza onto Israel that continued throughout the day on Monday. "Reprehensible," tweeted Jason Greenblatt, a senior adviser to President Donald Trump and his special envoy to the Middle East peace effort. "Mortars fired from Gaza at a kindergarten and community in Israel!" 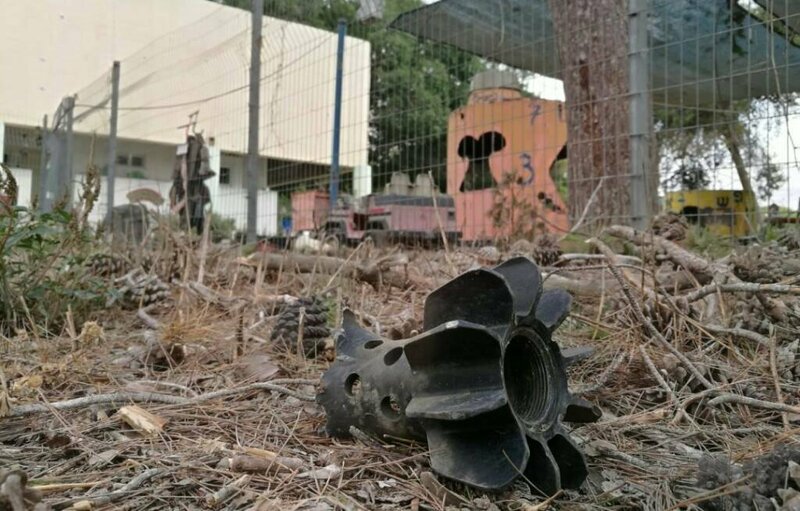 Reprehensible – mortars fired from Gaza at a kindergarten and community in Israel! Hamas has failed – all it can offer is terror. Palestinians in Gaza need real leaders to work on Gaza’s real problems with its water, its economy and so much more. "Hamas has failed– all it can offer is terror," he continued. "Palestinians in Gaza need real leaders to work on Gaza's real problems with its water, its economy and so much more." Greenblatt hosted a rare conference on the humanitarian crisis facing Gaza earlier this spring that brought together diplomats from Israel, Saudi Arabia, Qatar, and the wider Arab world, as well as other global players. He and Jared Kushner, the president's son-in-law and senior adviser, plan on releasing their plan for Middle East peace over the coming weeks and months. Politicians on the right and left talked tough after the attack from Gaza on nearby Israeli towns Tuesday. Former defense minister MK Amir Peretz (Zionist Union), a resident of Sderot, said that the salvo from Gaza was unlike anything seen since 2014’s Operation Protective Edge and called on the IDF to respond. “It doesn’t matter if it’s Hamas or Islamic Jihad. Hamas is in charge in the Gaza Strip and it must pay the price,” Peretz added. Yesh Atid MK Haim Jelin, the former head of the Eshkol Local Council, which was struck by mortars, called on residents to continue their daily routine, and for the government to make sure there’s an appropriate response that leads to an end to the shootings. “Protective Edge ended with the heads of Hamas knowing that we bombed their families’ homes. They also have vulnerabilities. They cannot disrupt our daily lives and civilian resilience,” Jelin stated. The EU’s ambassador to Israel, Emanuele Giaufret, as well as the UN Special Coordinator for the Middle East Peace Process, Nickolay Mladenov, both focused on one of the shells striking a tree in the yard of a kindergarten in the Eshkol region, less than an hour before students were due to arrive. Tuesday morning’s barrages of mortar shells and rockets into southern Israel were quickly rumored in Gaza to be the work of the Islamic Jihad terror group. And hours after more than two dozen mortar shells hit Israel, the IDF carried out retaliatory strikes that were mainly directed at Islamic Jihad’s military wing. Islamic Jihad’s role indicates we are witnessing an attempt by Iran to spark a war on the southern border. And if the deterioration of the situation is not halted in the very near future, the attempt may prove successful. Already we have seen an attack on Israeli targets unprecedented since 2014’s Protective Edge conflict, with a consequent Israeli response against targets in Gaza. The Islamic Jihad barrages were ostensibly aimed at avenging Israel’s reported killing of three of its operatives, who were attempting an attack, earlier this week in the Rafah area. That was the immediate pretext. But the nature and scale of the Islamic Jihad response — heavy fire at civilian targets in Israel — indicates that revenge was not the only motivation. It is possible that this is at root an Iranian move, seeking to have Israel pay a price in the south for targeting Iran in the north — across the border in Syria. After all, it is hard to believe that Islamic Jihad, a smaller ally-rival of Hamas which is financed and trained primarily by the Iranians, would have initiated this kind of action, with its dramatic consequences for Gaza, without Tehran’s approval. The Be'eri Crater Reserve adjacent to the Gaza border is considered to be among the most picturesque tourist sites in the region, with its green landscape serving as a natural habitat for a variety of species of animals. During the winter, the nature reserve was covered by a blanket of multiple shades of green, interspersed with red roses in what was a symbolic testament to the success of making a desert bloom. In recent weeks, however, the greenery has been replaced by a blackened and charred landmass caused by incendiary kites flown over by Palestinian rioters from the Gaza Strip, whose latest weapon in their arsenal is wreaking havoc on southern residents and farmers. On Sunday alone, 200 more dunams were incinerated by the kites which are affixed with Molotov Cocktails. Since the kites were first used in April as part of what Gazans describe as the “March of Return” protests, the "aerial terror offensive" against the Israeli border communities has continued with greater vigor, including some 300 incendiary kites flown into Israel's territory, causing 100 fires and decimating more than 3,000 acres of wheatfields. In addition, millions of shekels worth of damage has been caused to the farmers of the area. The Israeli army on Tuesday afternoon struck what it said was a Hamas tunnel in the Gaza Strip that extended hundreds of meters into Egyptian and Israeli territory. The IDF said the U-shaped attack tunnel destroyed near Rafah and the Kerem Shalom border crossing was still under construction and not yet usable. The military said the tunnel crossed from Gaza into Egypt and from there into southern Israel, and was intended both for smuggling weapons and for attacks against Israel. Its full length was around 2 kilometers (1.2 miles), the army said, and the segment inside Israeli territory was 900 meters (half a mile) long. The military discovered the tunnel in the past two weeks, an army spokesperson said. Israeli officials reportedly informed Egyptian counterparts of the planned strike on the tunnel, according to Hebrew-language media. It was not clear if Israeli strikes on the tunnel included action over the border in Egypt. UN Watch: Were Top UN Human Rights Officials Right on Gaza Violence? In response to Israel’s acts of self-defense on the Gaza border to prevent armed Hamas terrorists from storming the fence and heeding the calls of Hamas leaders to massacre Israelis—in their own words, to “tear out their hearts from their bodies,” and “draw the map of return in blood”—UN human rights officials rushed to condemn only Israel for “excessive” and “disproportionate” force against supposedly “unarmed demonstrators,” while completely ignoring Hamas’s role in and responsibility for the violence. On May 18, 2018, the UN Human Rights Council held a special session on the violence, and adopted a one-sided resolution condemning only Israel, and failing to even mention Hamas. The resolution presumed Israel guilty of violations of international humanitarian law, international human rights law, and war crimes, and created an international Commission of Inquiry into Israel’s actions. May 18, 2018 statement of High Commissioner for Human Rights Zeid Hussein. May 18, 2018 statement of Special Rapporteur for Palestine Michael Lynk. May 15, 2018 statement of Special Rapporteurn for Palestine Michael Lynk. We found six primary concerns with these statements. European Union foreign ministers met on Monday to discuss the conflict between Israelis and Palestinians and in particular the latest violence in the Gaza Strip. Hostilities have soared since Hamas, the terrorist group that controls Gaza, launched a border riot campaign on March 30. Israel has repeatedly presented evidence that terrorists have been using the mass demonstrations as cover to try to breach the border and carry out attacks. As they were arriving for a meeting of European Union foreign ministers in Brussels, the EU's top diplomat, Federica Mogherini and the Dutch and Belgian foreign ministers said they would continue to push for a two-state solution with Jerusalem the capital of both states. "We will have a discussion with the ministers on the situation in Gaza," Mogherini said. "As you know, the commitment from the European Union and member states to continue to work for a two-state solution with Jerusalem as the future capital of both states is solid, and we will brainstorm a bit with the ministers on how we can try to move this agenda forward." Responding to the protest campaign and appeal of UN Watch, democracies have strongly protested Syria’s take-over of the presidency of the UN-backed Conference on Disarmament. The United States will stage a walkout in protest at Syria’s presidency of the Conference on Disarmament at the United Nations in Geneva, US Ambassador Robert Wood told reporters on Tuesday. “We are going to walk out at some point this morning and we will be taking other actions that you will see over the course of Syria’s presidency, so please stay tuned,” Wood said. Washington did not plan a boycott of the four-week presidency but wanted to hold Syria to account for its use of chemical weapons, he said. Ronen Lubarsky, an Israel Defense Forces’ soldier from the elite Duvdevan army unit, was laid to rest on Sunday morning at Jerusalem’s Mount Herzl military cemetery. The 20-year-old from Rehovot passed away two days after a large slab of marble was dropped on him during a mission to arrest terrorists. Lubarsky was brought to Jerusalem’s Hadassah Ein Kerem Medical Center in critical condition on Thursday, when supporters of terror suspects in al-Am’ari refugee camp near Ramallah dropped a marble slab on his head from the third story of a building on Thursday morning. The IDF reported that he had been wearing a helmet. The army posthumously promoted him to the rank of staff sergeant. A large IDF force entered the al-Am’ari refugee camp in Samaria on Monday and began carrying out house-to-house searches to find the attacker who on Thursday fatally wounded Ronen Lubarsky, a 20-year-old Israeli soldier from the elite Duvdevan unit. Riots broke out in the camp as the soldiers entered, with residents throwing homemade bombs and rocks. Soldiers were forced to respond with riot-control measures. At least 13 Arabs were lightly to moderately injured. Lubarsky, of Rechovot, was critically injured in an operation to apprehend terror suspects in al-Ama’ri when a marble slab was dropped on his head from a building three stories above him. He was transferred to Hadassah Ein Kerem Medical Center, but died of his wounds and was buried in the early-morning hours on Sunday at Jerusalem’s Mount Herzl military cemetery. Despite an official boycott by the Palestinian Authority of Washington following US President Donald Trump’s recognition of Jerusalem as the capital of Israel, a senior PA official reportedly met with Mike Pompeo last month, days before he was sworn in as US secretary of state. The meeting in Washington between then-CIA director Pompeo and Majed Faraj, head of the PA’s General Intelligence Service, was known to PA President Mahmoud Abbas and to a small number of high ranking officials, Haaretz on Monday quoted senior Palestinian officials as saying. It would be the highest-level contact between the PA and the US in over six months. The Palestinians strongly objected to the US decision on Jerusalem and the subsequent relocation of the US embassy from Tel Aviv to the capital earlier this month. The Palestinians believe the US move undercuts their claim to parts of Jerusalem as the capital of a future state. Abbas froze ties with the Americans after Trump announced the move in December. The Israeli navy stopped and seized control of a boat carrying demonstrators as it tried to leave the Gaza fishing zone on Tuesday in defiance of Israel’s blockade of the coastal enclave. The navy said after it had been searched, the boat would be towed to port in the Israeli city of Ashdod. Organizers had said the vessel was carrying wounded Gazans seeking treatment, and the IDF said medics were waiting to treat the sick or injured on board if necessary. “Afterwards the Palestinians will be returned to Gaza,” the army said. US President Donald Trump’s special envoy to the Israeli-Palestinian peace process, Jason Greenblatt, on Tuesday slammed the “reverse flotilla,” an effort by Palestinian activists to break Israel’s naval blockade of the coastal enclave, set to get underway later in the day. In a series of early morning tweets, Greenblatt condemned Hamas, which has ruled the Strip since 2007, for what he termed “deadly theatrics” that needlessly imperil the lives of innocent civilians. “Shame on all involved in inciting the so called ‘reverse flotilla’ today. Hamas treats this like a play being acted out for a live media audience. But these are real lives Hamas is cynically risking in a grim bid to hold on to power,” Greenblatt wrote. “There is no shortcut for a better future for all people in the region. Hamas must stop with deadly theatrics needlessly putting lives at risk and begin the process of building better lives for the Palestinians of Gaza and their neighbors,” he went on.